Bathroom cleaners often contain aggressive chemicals and abrasives, designed to clean ceramic and porcelain surfaces. These cleaners are likely to damage, deteriorate or discolour The Dispenser. The best method for cleaning the dispenser is simply using a soft damp cloth. Click here to view a video on how to install your Dispenser (AVIVA shown but is applicable to all products). If you are still encountering difficulty in the installation of your Dispenser, this should solve the problem. 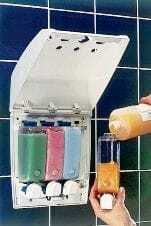 The Dispenser has been designed to be installed without damage to the wall surface and no tools are required. When installed properly, the unit WILL NOT FALL DOWN! You must use BOTH the double faced tape AND the entire tube of silicone adhesive for your installation. The tape must be there to hold the unit while the silicone adhesive cures (in 24 hours). The tape alone will not hold the unit once it is filled. Do NOT FILL the unit for 24 hours after installation. The silicone can easily support much more than the weight of the full Dispenser but not until it has cured completely. The curing time for this adhesive is 24 hours. Surface contaminants such as Dust or Dirt, Grease or Oil, Wax (especially prevalent on moulded fibreglass shower surrounds, where it is used in the manufacturing process to release from the unit), Water, Detergent or Soap or their residue, loose particles or skin and body oils may prevent the silicone adhesive from making a strong bond with the wall surface. We hope that this advice solves your problem. If not, we are certainly always eager to help. The most likely cause of this problem is that the Pump and/or the Valve is clogged and simply requires removing, washing in warm water and replacing. Alternatively the spring or the pump seal is damaged. If so, please replace the pump. A new pump can be ordered online. Push the pump button in. Check to see if the valve in the neck of the bottle has been lost or removed. Valve with ball is necessary for pump to operate. Replace valve if it is missing. If you have been using The Dispenser for a while with no problems, liquid may have coated the inside of the pump chamber. Unscrew the pump from the bottle and flush with warm water. Put the pump back on the bottle; be sure to prime the pump again. Use a sharp serrated knife to slice the silicone and tape between The Dispenser and the wall. Alternatively a length of thin fishing wire can be used in a sawing fashion between The Dispenser and the wall. If you require a new installation kit, click on Replacement Parts on the top Toolbar, go to your Dispenser family and order the appropriate kit. Insert a small screwdriver into the bottom opening (just in front of the pump nozzle). Making sure that the screwdriver is seated on the pump as shown; slowly pry off the front cover. Remove the button and install the new one.